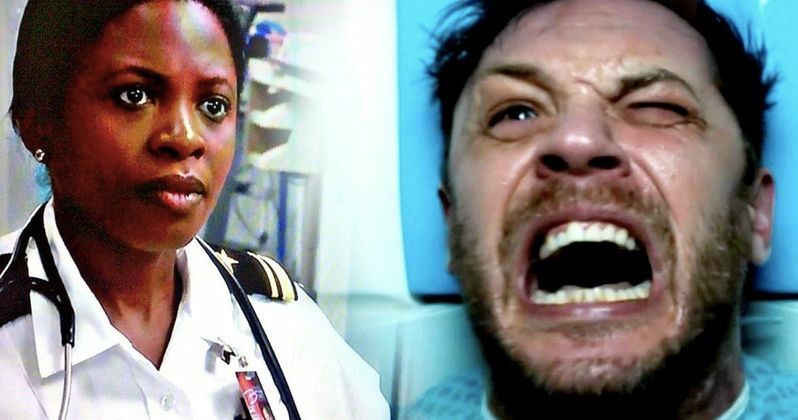 Actress Sope Aluko has officially joined the cast of Sony's Venom movie. The Black Panther star has landed a role opposite Tom Hardy in the Spider-Man spin-off about the Marvel Comics villain turned antihero, which also stars Michelle Williams, Riz Ahmed, Scott Haze, and Reid Scott. Marvel fans were shocked to see a teaser trailer for Venom last month, especially since production had just wrapped. And it was met with mixed reviews (to put it lightly). However, we're still 7 months away from seeing the final cut, so that should give Ruben Fleischer plenty of time to edit and do reshoots. Sope Aluko was last seen on the big screen as the Shaman in Marvel's Black Panther, which is still number one at the box office as of this writing. Her character in Venom has yet to be revealed, but we'll find out soon when reshoots start to come together. Aluko was born in Nigeria and raised in England. She has dual citizenship in both the United States and the U.K. and can also speak 4 different languages, thanks to the extensive traveling she experienced when she was younger. Sope Aluko studied acting and dance back in the U.K., which resulted in performances with the prestigious South African Ipi Tombi dance at the National Arts Theater in Nigeria. Even with all of her dramatic arts and dance experience, Aluko earned an undergraduate degree in Engineering and a master's degree in Marketing and spent some years in the corporate setting before heading to the United States to pursue acting. She has been seen in several television shows from Law and Order SVU all the way to Parks and Recreation. Venom fans were left with a bad taste after the lengthy teaser trailer for the upcoming movie came out and made the project look like what some have called a "generic action movie." None of the sci-fi aesthetic was really shown off, which sets the Venom story apart and there was no real sign of the symbiote. Fans were hoping for the sci-fi horror hybrid that had been promised by director Ruben Fleischer and the teaser didn't really highlight anything like that, so fans remain skeptical. It just seems like the studio jumped the gun on releasing too much footage so far in advance. Venom doesn't come out until October, so there's still plenty of time for the movie to take shape. In addition, Tom Hardy will more than likely have to come in for reshoots to get the motion capture work finished, since we never saw any of evidence of that taking place in the behind-the-scenes shots that were shared or any of the leaked photos from the set. It will be interesting to see where Sope Aluko fits into the Venom world when this Spider-man spin-off is complete. You can read more about the Black Panther actress joining the cast of Venom over at Deadline.